Please scroll down to browse our selection of Guenter Knop's original photographs. Knop's background is in high fashion and commercial photography. His career began with renowned German fashion photographer Charlotte March, whose groundbreaking images blurred the lines between commercial and fine art photography. 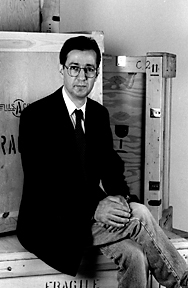 Knop moved to New York, and in 1983 became first assistant to Henry Wolf, trend setting art director for Esquire, Harper's Bazaar and Show Magazines during the 60's. Knop worked closely with Wolf in his Manhattan studio, creating images for high fashion as well as distinctive advertising for major clients. Over the years, Knop has developed a unique working process. His subjects are not professional models, and his sessions are a collaborative process between photographer and subject. The final image evolves organically as the subject relates to the photographer and the camera. Knop's lighting is dramatic; he juxtaposes architectural and sculptural elements with the fluid form of women, creating surprising images that seem to reveal changing elements as they are viewed. He utilizes line, texture, shadow and light in a way that is both abstract and sensual. Knop has had exhibitions in Germany, France and New York, and his work has been featured in many magazines and photographic journals. All are Silver Gelatin prints and are handsigned by the photographer. The 16"x20" prints are from an edition of 25 and the 11" x 14" prints are from an edition of 50. In addition to the selected photographs shown here, The Gallery has many more of Guenter Knop's nudes. All are available for viewing at The Old Print Center.